I can only imagine it would have been the overall warmth of May, June and July (maybe December too) which brought the annual CET so high. Most of the other months seem normal enough, with the exceptions of February and March which were actually quite cold. Just goes to show though that even exceptionally warm years are capable of containing exceptional cold spells, but if it were not for that cold period in late February/early March the annual CET would no doubt have ended up higher. What's clear though is that year's above 10c in the CET record were fairly rare until around the end of the 1980s, after which they have become the norm, especially since the mid 1990s, with 19 of the 25 years from 1994 to 2018 having an annual CET above 10c. Our last one below to date was 2013 and our last one below 9c to date was 2010. Before then you have to go all the way back to 1986 for one before then, prior to which they were more common with 6 years below 9c in the 25 years from 1962 to 1986 and only 3 above 10c. So it's clear to see years on the whole in the CET region, are warmer than they used to be. Really? January, April and November were also well above average and August was also warmer than average. Cool months have been the exception rather than the rule this year, that's for sure. There can't have been many years with more warm months than this one. I will certainly remember it for being warm with the only real cold spells being in February and March. December may have been well above average overall for the CET at 6.9, making it the tied 15th warmest (with 1953, 1918, 1833 and 1827) in the CET record, but I have to say that, a December with a CET close to that sort of figure was long overdue. This is when you look at the fact that the warmest December in the 27 years from 1988 to 2015 is just 6.5*C (which still wasn't one of the top 20 warmest Decembers on record). This was notable given the warmth seen in most other months of the year during this period. December 2018's CET of 6.9 only just sneaked into the top 20 warmest Decembers in the CET record (the tied 20th warmest is 6.8). It was so close to being a 7*C December (7.09 before adjustments) but the month end downward adjustment failed to get the official CET to 7*C, when it looked likely that we could have been in with a chance of a 7*C CET for Dec 2018. Anyway, the second warmest December in the 30 years since 1988 is now confirmed by the CET records. The Hadley EWP tracker is at 115 mm after 30 days, will probably add only a minimal amount to that but I will hold off posting the provisional scoring until they do confirm a total (then adjust that when the table is updated). Have you put it out there, you know actually taken part in competition for January? If you haven't then id expect the usual criticism and I told you so.............. sad. From 6.9, according to table of entries, this would be the top portion of the scoring ... numbers in brackets are the order of entry, which separates those with similar errors. J10 will confirm this in the scoring table and that will also clarify how late penalties factor into the scoring. LG at 12.0 (+5.1) is the only entrant above the lone higher than 6.9 forecast above (8.0, 15th) and ranks 66th of 66 as largest negative error is -4.6. The Hadley EWP tracker has reached the 31st now and is still on 115 mm. This is a preliminary look at the top ten EWP scores. When the table is updated with a final value, I will post an excel file showing all scores. (note on EWP scoring. ... equal forecasts lose 0.1 per later entry, and a further 0.2 for each day late ... unlike CET scoring, points for equal errors on either side of actual value are the same (see T4 above). 7th would have tied 6th except for a late penalty in addition to the order of entry deduction. The best combined forecast for December (provisional scoring EWP) was 6.3 C and 117 mm (Feb1991Blizzard) ranked third in both contests. Another good combination was Reef with 6.0 C and 120 mm (9th and 7th). Just wondering if anybody knows whether the records for the annual CET are adjusted to take into account the UHI effect, like the monthly ones are? The fact we have been getting such a dominant concentration of 10c+ CET years since around the end of the 1980s could be partially explained by that. I've no doubt that in that time it generally has gotten warmer. But for example it can't be explained by milder Winters alone. Just take the 1920s and 1930s for example. Winters were generally mild in those two decades yet only 1921, 1934 and 1938 were 10c+. I can only imagine a series of cooler Spring's, Summer's and Autumn's must have kept many of the annual CET's down during those years? The annual CET is just the average of the twelve monthly values. The adjustment is built into all reported CET values. With the December CET of 6.9c being 2.3c above average, no one got it spot on. syed2878 was closest 0,4c out. Froze were the Days was 0.5c out. 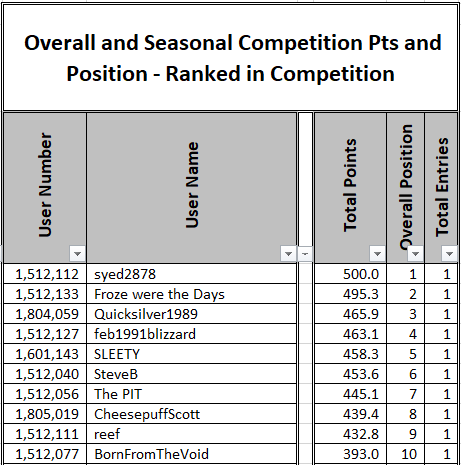 The Overall and Seasonal Top 5 was the same as the monthly Top 5. 2. Froze were the Days was 0.5c out. Hadley EWP now posted at 115.8 mm. Top score of 10.0 to Blast from the Past (115.0mm ) followed by 9.8 for Feb1991Blizzard (117.0 mm) and Singularity with 9.6 (114.0 mm).